Back in June atWWDCApple unveiled a host of new features in its yearly software update for iPhone, iPad and iPod touch. After a beta period, iOS 9 is now finished and ready for you to download. iOS 9: will your device run it? Apple has been known to drop support of its older devices with each new version of iOS but don't worry, if your device can run iOS 8 then it will be able to run iOS 9, as Apple has promised that it won't drop support for any devices this year. When iOS 9 is released, you now only need 1.3GB of free space to install it – quite a drop from the amount iOS 8 needed, which is great news for those of us who previously had to delete a load of videos and photos just to install the new operating system. As usual, iOS 9 will be a completely free upgrade, so put that wallet (or Apple Pay-enabled device) away. Since Apple bought Beats Music last year, it was only a matter of time before it unveiled its new music streaming service to rival Spotify, which it has done with the reveal of Apple Music which will “change the way you experience music forever”, according to Tim Cook. It comes with Apple's first 24 hour a day radio station – Beats 1. Meanwhile the Connect feature allows bands to share music, mix tapes, photos, lyrics and more with their fans. Apple (rather humbly) claims that Apple Music is a revolutionary music service that's curated by leading music experts that have been hand picked. Playlists will have a human touch, making sure you have the right music at the right time. No more setting up a playlist, listening to a tune and then the next song comes on and it's a jarring change of tone. The For You section of Apple Music features personalised recommendations based on what you listen to and love. It's not just a bit of software suggesting this – it also uses real humans and music experts to bring you new music that you're going to love. Apple Music launches at the end of June and a subscription starts at $9.99 a month, although it's free for the first three months. For families you can get a $14.99 for six family members, with each person being able to access their own music and playlists. Siri serves over a billion requests a week, and it's now 40% faster than ever. Siri will also come with a new lick of paint and a brand new user experience in iOS 9. Siri has gotten a lot smarter as well, and can tell when you're in your car, so you could ask it to remind you to remove the coffee from the roof of your car when you get in. If you want to be reminded about something when you get home, Siri can help you out there as well. Siri in iOS 9 now learns how you use your phone – and it's context sensative depending on the time of day and your location. Keeping track of events has got a lot easier with Siri in iOS 9 as well, with Invitations that you get in an email instantly being put in your calendar, along with reminders for when you should set off, depending on current traffic conditions. Siri's search results have also been given an overhaul, allowing you to search third party apps. If you search for videos, you can now also play the videos directly from the search results. All of Siri's search results are kept on device, so none of your important details are shared with third parties. It is anonymous, not associated with your Apple ID and, as Apple promises, you're in control. Apple Pay has also been given a big boost with iOS 9, with Apple's desire to replace the wallet in full force. New apps are being added to the App store each day, encouraging iPhone and iPad owners to pay using their devices. Rewards card will be included with Apple Pay on iOS 9, so you can get racking up your reward points as you buy. Passbook is now renamed Wallet – and it will be one place for your credit, debeit, reward cards and more. Apple also announced that Apple Pay will be coming to the UK in July, launching with eight of the biggest banks in the UK. Marks and Spencers, Waitrose and many more stores will be partners, and you'll be able to pay for your bus, train and public transport when you climb aboard - all with Apple Pay. News is the new way to get all the latest breaking stories from some of the best sources from around the world. It allows you to turn your iPad and iPhone into a gorgeous looking personalised newspaper – bringing you the best stories from your favourite websites. If you want to find out new websites, you can click “Explore” to find new websites that will appeal to you based on previous news stories that you've read, and any topics that you're interested in. The iPad is going to be a big beneficiaryof iOS 9, making it easier than ever to use. For example, the keyboard of the iPad has been transformed with iOS 9 and QuickType, so by bringing two fingers down the screen, it brings up a trackpad, making it easier than ever to control the iPad. A host of new shortcuts will also make life a lot easier when typing on the iPad. If you have a Bluetooth keyboard to type on your tablet, then you can still hook it up to the iPad, and all the shortcuts will be included and brought over to the physical keyboard. 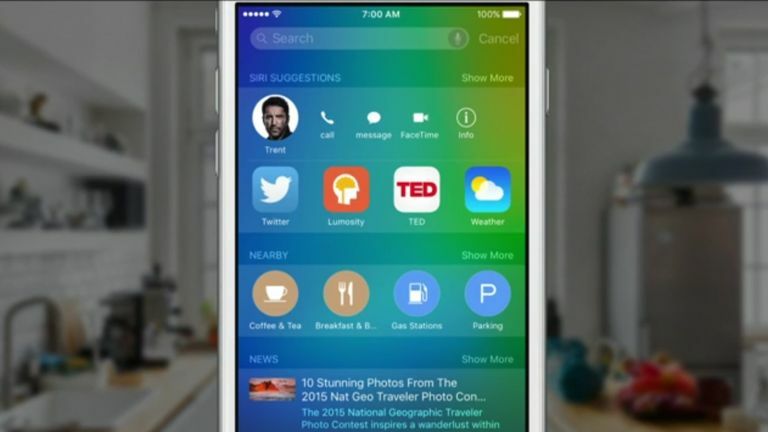 iOS 9 is also taking multitasking to a whole new place. A double click on the Home button lets you bring up the App Switcher screen, while Slideover allows you to quickly bring apps, such as Mail, from the side, which are fully interactive. Splitview lets you work with two apps side by side, and you can change how much of the screen each side takes up – so you're not just stuck with a 50/50 split. If you want to make an app full screen, just drag the side to increase the app's size until it takes up the whole display. The idea is that working with multiple apps on your iPad quicker and easier than ever before. If you use your iPad when working, this will be a life saver. If you want a break from work and start streaming videos, you can now have video apps play in a small windows in the picture in picture mode, letting you use other apps while you watch. The iPad Air 2 gets most of these features, with the older iPads getting a range of new features as well, so you'll want to keep an eye out for iOS 9 if you have any of Apple's recent tablets. Unlike its competitors, Apple Maps has been resolutely focused on car drivers, but an increasing number of people use public transit – and Apple has finally acknowledged it with the Transit map, which will help people navigate subways, trains and buses. You can click on a station and you'll see all the lines that run through it. You can even get walking directions and times that will help you catch your train or bus on time. Siri has also been integrated into Transit to help you find the right form of public transport quickly and easily. Transit will be rolled out to Baltimore, Belin, Chicago, London, Mexico City, New York, Philadelphia, San Francisco, Toronto and Washing, D.C, along with a number of Chinese cities, with more following soon. With the main Map app you can also search nearby locations with just a tap, and if you're searching for nearby shops it will tell you if the store supports Apple Pay. Apple's Top Gear-pleasing CarPlay is present and correct with iOS 9 and now supports car manufacturer specific apps, giving you complete control over the car you're driving. In future cars you'll be able to get into your car and experience CarPlay without having to take your iPhone out of your pocket. No more faffing around with your iPhone before you set off on your journey then, which is pretty neat.